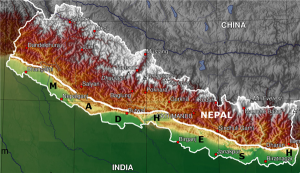 Madhesh or Terai lies at the foothills of Himalayas. It is mostly the plain land on the southern side of Siwalik range in Nepal. It is situated in the Outer Himalayan Zone, and has been created by orogenic activity as well as by alluvial action in the Siwaliks and the Himalayan ranges (Spate and Learmonth, 1967). In addition to the plain land, it includes some low lying inner valleys, north of Siwaliks, and is referred as ‘Vitri Madhesh’ (Inner Madhesh). Its total area is 23,068 square kilometers. The climate of Tarai is subtropical, similar to northern plains of India. The hot and humid summer lasts from March to June, and the monsoon from late June to late September. The winter from November to February is mild, though bouts of cold waves hit the region.